I have been PDF'ing dozens of copies of old charters and deeds to get rid of clutter. 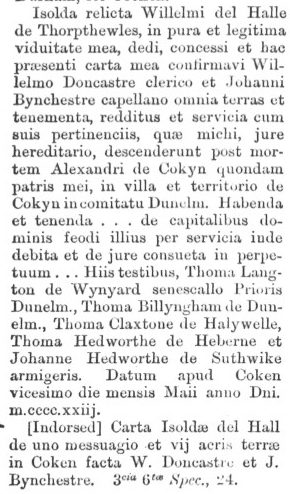 Before I binned the scaps I glanced at them and saw in one of them a reference to an Isolda who was the relicta of a Willelmi del Halle de Thorpthewles. I enclose the reference below. I have looked for the missing bit and cannot find it so the reference is incomplete. I remember one of your group members telling me that Hall's Banks has that name because it was land owned by the occupants of old Hall - now the Vane Arms. But could it be so named because it belonged to Willelmi del Halle de Thorpethewles? I do not think he was William of the old Hall at Thorpe Thewles. I'm thinking that there was a family called Halle of Thorpe Thewles circa 1423. What do you think? Have you heard of the Halles? I chopped up a page of the Halmota Prioratus Dunelmensis. Surtees Society Vol 82. If you can get hold of a copy of Vol 82, Isolda will be in its index. 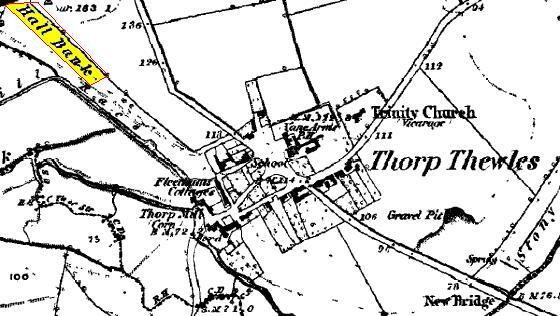 The earliest map reference to this field/location name to the north-west of the centre of Thorpe Thewles village is in 1861. It is called by the name I am more familiar with, i.e. Hall Bank and not “Hall’s Banks”. This plot of land is located on a fairly steep bank along the route of the old fleam that once fed Thorpe Water Mill. Someone once suggested that this field name came from the plot of land’s close proximity to Grindon Parish Hall in Thorpe. However, this can’t be the case as the field name pre-dates the building of the Parish Hall by at least 70 years. I don’t think the bank can take its name from the old Hall in the village (now the Vane Arms) as its quite a distance away. I guess there could have always been an earlier and closer Hall site that gave its name to the bank. I like your idea of the bank taking its name from an ancient local landowner by the name of Halle. There still is a land owning family in the area residing at Middlefield Farm. However, talking with them some time ago I know their family connections with the area only go back a few generations and before that they lived in Northumberland (I think). I wonder if anyone else can throw any further light on this field name mystery?